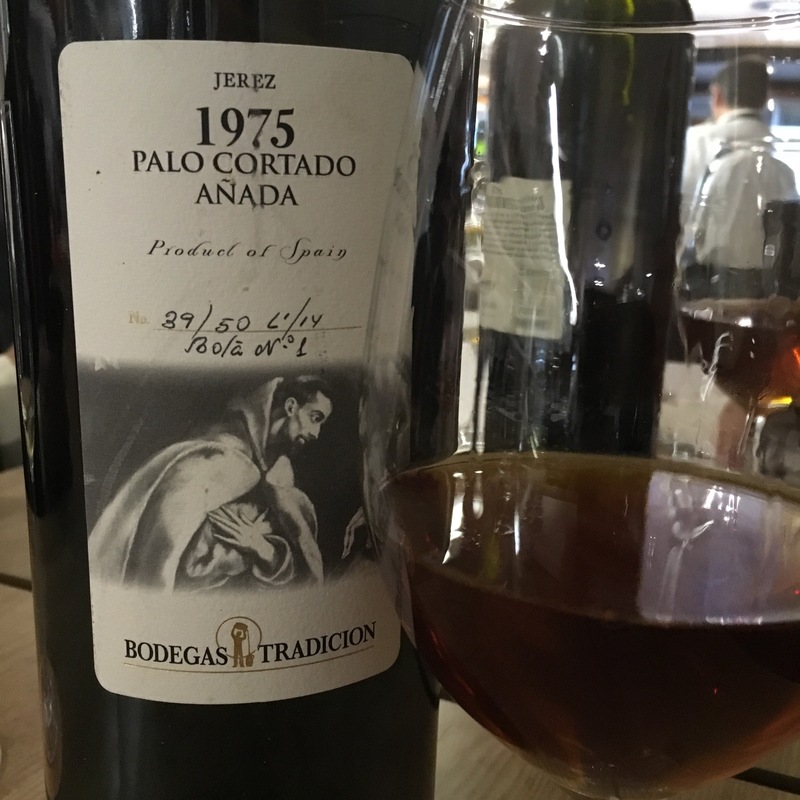 Another vintage specific wine, again during a terrific lunch at Restaurante Vinoteca Garcia de la Navarra (you can just see the great Luis in the background there), but this time a 41 year old Palo Cortado (although only 39 years oxidative ageing, from a saca in 2014) – number 39 of the 50 magnums produced. Intriguingly it says Bota Nº1 – wonder how many more of these they have waiting for release? Again the photo strikes me as deceptive (I didn’t notice dim lighting at the time but it may be the light behind). Nevertheless, it was a deep reddish brown – maybe a touch darker than usual – then on the nose the overwhelming memory is of elegance, a nice salty caramel, fresh citrus, and maybe just a hint of polish. The palate is even more refined and elegant – a really clean, fresh and delicately structured mouthful. Nice caramel flavours with a delicate citrus flavour, then a pleasingly integrated salinity and acidity, then a slightly more burnt caramel and bitter citrus aftertaste – and a pleasant finish that fades out. What is most notable is that cleanliness and definition. It doesn’t have any of the astringency or old barrel flavours I associate with a 40 year old palo cortado (not having been in a solera it doesn’t have that famous teaspoon of “infinitely old” wine), although perhaps if you were being very critical (and maybe for the same reason) neither does it perhaps reach the very heights of intensity either. I am often bemused when people call the real brutally intense dinosaurs of the cellar “delights”, but for this extremely youthful forty one year old, that description is absolutely spot on – a delightfully elegant wine.